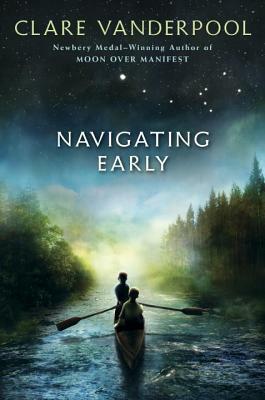 The latest novel from Clare Vanderpool, Navigating Early, arrives in stores today. Had I known about her Newbery-winning debut novel, Moon Over Manifest, before its publication, I’d have recommended you get your hands on it as soon as it was available. This time, thankfully, I have that opportunity. At the end of World War II, Jack Baker, Kansas born and raised, son of Colonel John Baker, Sr., is suddenly dropped at a boarding school in Maine after his mother’s death. Used to the steady flatness of Kansas, the roiling ocean makes Jack sick the first time he lays eyes on it. It’s the perfect analogy of Jack’s new life. What once was steady and firm is now constantly moving and unstable. Everything is different. Well, except for the fact that his father is still absent due to his military obligations. At Morton Hill Academy, Jack meets Early Auden, a unique student who shows up to class sporadically, who lives in a custodian’s workroom rather than the dorm, and sees a story in the infinite, non-repeating decimals of pi. Like Jack, Early has also lost a parent. His father. And both boys are lost, or in danger of getting lost, as they seek solid reassurances to hold onto in life. Early holds to the belief, irrationally, it seems, that his brother made it home safely from the war and is only lost himself, despite what the military has informed the family. Early looks for comfort in Pi’s story revealed to him in the numbers of 3.141592653589793238... Jack looks to Early for guidance, first as his coxswain when rowing, and then as they journey together. As Early seeks stability in his quest, Jack seeks stability with Early. Navigating Early has many layers. Readers get Jack’s and Early’s stories, obviously. Then there’s Pi’s story, as told by Early, about how Pi journeyed away from home. When Jack is drawn along on Early’s own journey, parallels between both begin to appear. There are great bears, colorful characters both dastardly and kind, both lost and found, and hoped-for yet elusive answers to difficult questions. The best way to discover Jack and Early’s story is journey with them. Leave the comfort of your couch and journey the Appalachian Trail with them searching for a great bear, difficult answers, and stability. At the very least, you’ll find a great story.